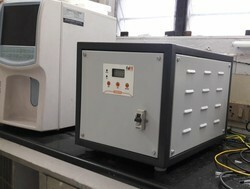 We are a prominent manufacturers and suppliers of a wide range of Digital Servo Controlled Voltage Stabilizer that is very efficient in controlling the voltage fluctuations. These protect the clients appliances from damaging due to short circuits or sudden voltage fluctuations. We offer these servo stabilizers in both Single & Three Phase upto 300 Kva.